Five short months ago we launched a Start Some Good crowd funding campaign to build a New Internationalist Magazine iPhone and iPad app. You, our wonderful subscribers and supporters, came through and pledged $9,309 – and today we’re launching the app that you wanted! Read all digital magazines in our archive on iPad, iPhone or iPod Touch. Download full magazines for off-line reading. Any articles you read are automatically downloaded to your device. Receive push notifications of new issues as they are published. Zoom any of the large format images for full-screen viewing. Native selectable article text so you can share your favourite section with friends, and use the built in thesaurus and dictionary. Guest passes are automatically created when you share an article on Facebook, Twitter or Email, so even if your friends aren’t subscribers, they can read the article you share with them on-line. Search the complete archive, even when you’re off-line. Select articles by theme, topic or category. Buy a single issue that you are interested in, or save by purchasing a 12 month subscription. 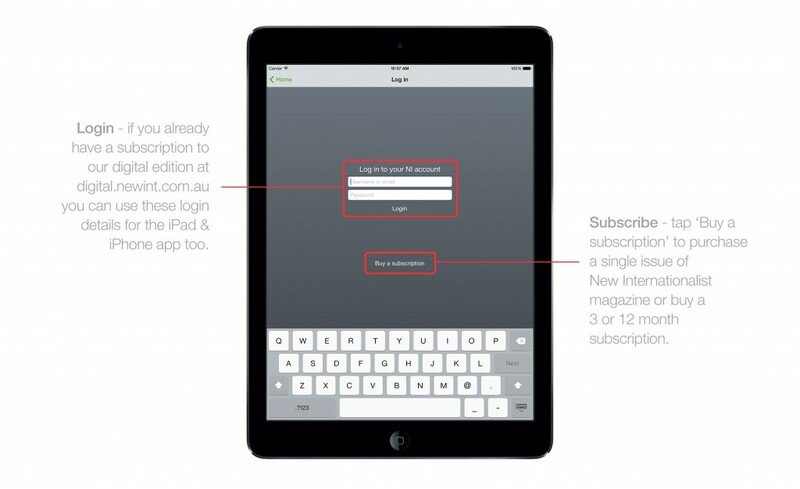 If you have an existing digital subscription, simply Login with those details to get complete access to the iPad, iPhone and iPod Touch version. Tap the latest magazine cover, or the words ‘Magazine archive’ to browse our complete archive of magazines on topics from whistleblowers and organ trafficking to refugees and climate change. When you find an article you’d like to read, simply tap that article and an alert will ask you to purchase a subscription or login. If you already have a username and password for our digital edition at digital.newint.com.au you’re in luck, you can simply tap ‘Login’ and enter those details. If you don’t have a current subscription, you can purchase one or purchase the single magazine you’re interested in by tapping ‘Subscribe’. Next you simply tap the item you’d like to purchase, and enter your AppleID to complete the In-App purchase. There’s more information about In-App purchases on the Apple site if you need it. Each of the automatic-renewing subscriptions come with a 1 month trial, so you won’t be billed if you cancel within the first month of use. Once the purchases is complete, you’ll be able to read the article. We love sharing, so we made it really easy to share magazines and articles with your friends, even if they’re not New Internationalist subscribers. Look for the share icon in the top right of the screen when reading an issue or article, tap that icon and the app will generate a Guest Pass for you to share via Facebook, Twitter, Email, iMessage or any other compatible app on your device. 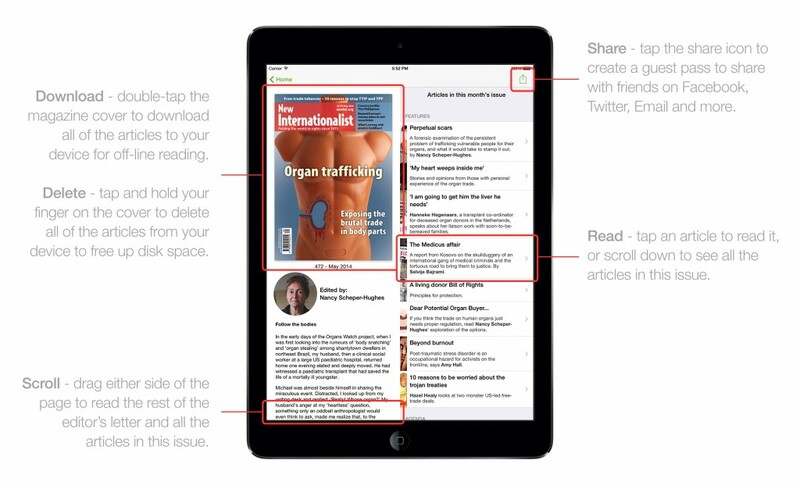 The app automatically caches any article you read for off-line reading. But if you’d like to download an entire magazine to your device for off-line reading, double-tap the magazine cover on the Table of Contents view. An alert dialog will then pop-up to ask whether you’d like to download that magazine. If your device is getting full, the Newsstand will automatically start to remove data from your cache for you to free up disk space. But if you’d like to manually remove a magazine from your device, tap and hold on the magazine cover on the Table of Contents and an alert dialog will ask you if you want to delete that magazine from your device. Note: this won’t permanently delete the magazine from your device, it will only remove the images and article text. 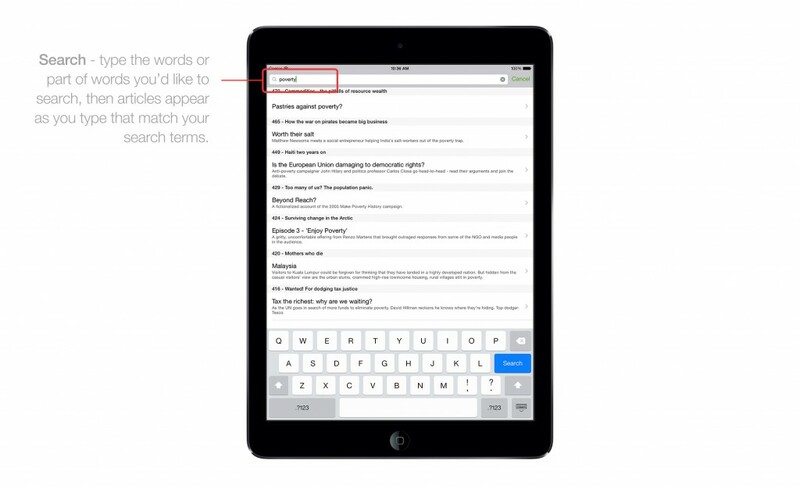 Tap and hold any words in an article to use the native Apple dictionary or thesaurus to help define words you don’t understand. Tap and hold to select favourite paragraphs to copy and send to friends. You can also tap the themes of an article (just under the article teaser) to read other articles written on that theme, not just from the magazine you’re currently reading, but also from earlier or later magazines in the archive. 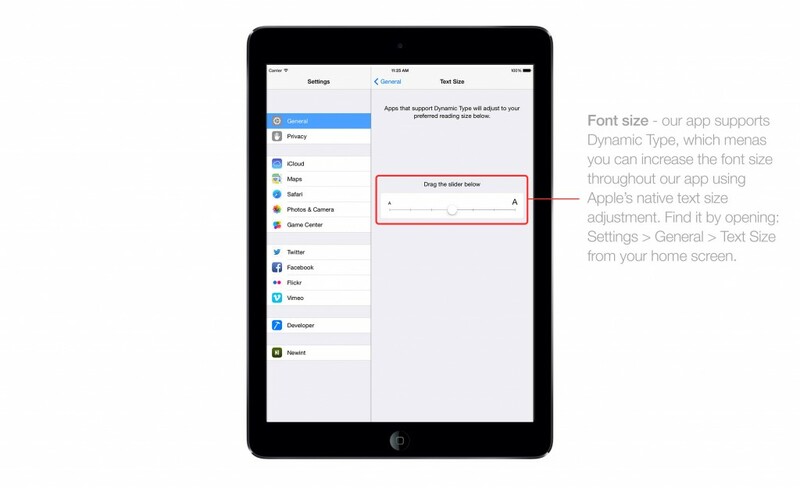 If you find that the text is a little difficult to read and you’d like to make it bigger or smaller, our app supports Apple’s Dynamic Type – which means you control the font size. General > Text Size > Drag the slider to your desired size. Search the entire archive, even when you’re off-line. We built this app with the help of the open-source software community, and have released it as open-source software on GitHub. If you’re a programmer and would like to contribute to future versions of the app, we’d love to hear from you. If you have any questions or feedback, please leave a comment below or get in touch via Twitter @ni_australia. Review the app for us! 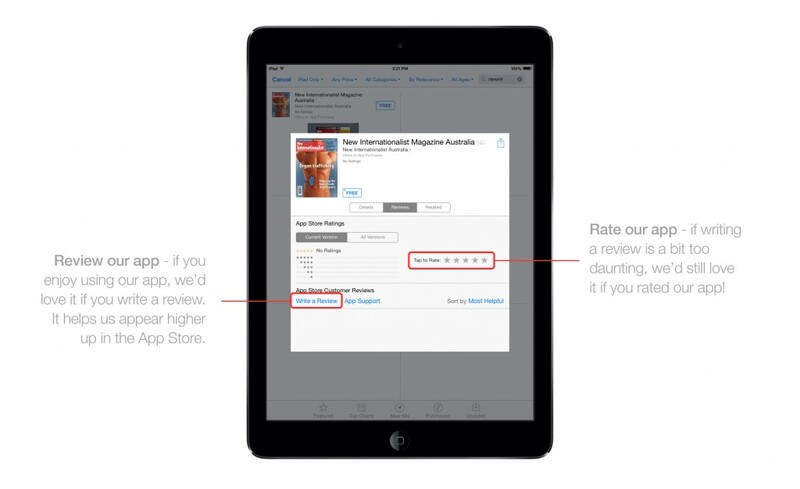 If you like the app, we’d really appreciate if you took the time to review it on the App Store – each positive review helps get us closer to the top of the list of featured magazines. To write a review or rate our app, open the App Store and search for our app, or tap the black app store button below. Then tap the ‘Reviews’ tab, and tap ‘Write a Review’. If you’d rather just rate our app by tapping the stars, that’d be great too. Hope you enjoy it as much as we enjoyed making it. This entry was posted in Technology and tagged app, apple, ios, iPad, iPhone, magazine, newsstand, subscribe by Simon. Bookmark the permalink. A couple of problems: if I am not a subscriber and I want to buy issues separately nowhwere on your app does it list my purchased issues and amongst so many issues in the archive I have no way of knowing which ones I have purchased. You should have an option for non-subscribers to be able to have a list of only the issues they purchased available. Secondly you also sell your magazine via Zionio. Seems that if I bought one of your issues from Zionio it is possible to accidentally buy same issue from your app and pay twice. Perhaps that might be solved if anyone buying even one issue has a subscribers account and to have that subscribers account connected to zinio as well. Suggestion: would be great to have some interactive articles, eg, with video, sound etc etc like National Geographic digital issues have. Ive upgraded to phone 6 and would like to restore several individual magazine I previously ordered. I’d like to know the procedure to restore. From the home screen of our iOS App (http://digital.newint.com.au/ios ) tap on the Subscribe link. A list of articles will appear. Scroll right down to the bottom and click on Restore Purchases. That should do the trick. I have subscribed but I have not received log in details. I have not been given the chance to create a username and password. Can you let me know where to find my username and password? Hi – i took out a 3 month subscription via the app. Where can I find my username and login? I can not find my user name and login details – or even where to request new ones. Please can you help! I can’t get into my digital magazine anymore. I am logged in and subscribed. Then when I try and open a topic it tells me ‘it doesn’t look like you are subscribed’. How can I fix this? Sorry you’re having trouble – I’ve emailed you asking for a few more details. I have a subscription via the Itunes store but the when I access the app it doesn’t update to the current January issue, it still shows the December one as themost recent one, even though it recognises that I have a subscription. Can you help? Sorry – we’re running a bit late with the January/February double issue this month due to extended staff holidays. It’ll be up soon! I need to end my NI subscription, but cannot log in to my account, I cannot remember my password. Can you help, please?